Greetings to you my sisters and brothers in Christ. Let me ask you this, are you willing? I have had people ask me how I picked the name 'WisdomTeachesMe', so I thought I would write it out. I humbled myself and said to Jesus, Lord, Please allow Your Wisdom to teach me. And since then, the knowledge, wisdom and understanding of God has been pouring into me ever since. Thank You Jesus-For as I am willing--God is Able! Amen. 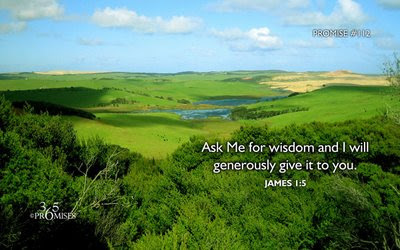 If you are a child of God--His servant, say outloud in the name of Jesus, God's Wisdom Teaches me. This is a confession of the truth that you know. If you recieve into your heart and Do what God's Wisdom Teaches you--then you are willing and teachable. I know that at times from a natural view it seems as if everything you do or touch just turns and falls as dust. The seed of fear has a strong root ball and produces many offshoots of growth. Fear is a choking weed that kills in order to survive. Many have taken their spiritual eyes off of God and have stopped yielding to the leading of His Holy Spirit. You must remember daily Whom you have chosen to Follow and Serve. Continue to make it your purpose to allow others to See the Value of Jesus in you. Amen. The root of fear will undermine your faith to believe for God's direction and provision. Aren't you ready for a change? You must determine to change your mindset and to stop having faith in failure. This thinking works against your ability to possess the Promises of God that Jesus died to give us. Remember that He died to give us Total Freedom in every area of our lives. We are not slaves nor are we sharecroppers in this life. Jesus said that we are His friends and that when we do Everything that He has done, then He knows that we love Him. The use of our faith is what strengthens It and because of this strengthening, we are prepared and enabled to NOT be surprised when we encounter opposition and adversity. Attacks against us from the enemy should be an indicator that we must be doing the Will of God. amen. Why would the devil come after his own people? He does not bother anybody that is not a threat to him. So if you are under attack then you must be doing the good works of God with the right motive in your heart! Also, if you are under attack you know right where you NEED to go--To the Covering of His Shadow! To the Secret Place of The Most High God. Call on Jesus to step into the gap that this attack came through! amen. Faith in God allows us to refuse to take these attacks as personal rejection. Faith stops the seeds of fear from being planted in our heart. Or, it stops the seeds that are already within us from being watered and fertilized by all the relatives of fear. If you know that you still have fears living within you--call on the Spirit of God to Weed Your Garden! Face your fears with God's Truth! They will die. God's Truth is a Great weed killer! amen. Faith stops the enemy from his evil plan of establishing a root ball of bitterness within your soul. The devil does his utmost to cause us to sin through anger and retaliation. We MUST SEE these attacks for what they really are and forgive those who have made themselves pawns of the enemy's plan against the Will of God for our lives. God wants us to make His Wisdom our Sister. To stay with Her, call on Her and do as She instructs us to do. We are to remain Righteous and wait Patiently for God's vindication concerning these planned and launched attacks against us. Don't allow satan to trick you and have you respond through your emotions and 'how you feel'. Forgive the people that are against you and know that these people have a root ball of fear living in them. That is what directs them and guides them through their flesh. They do not trust God nor do they trust IN God. All of this is a test. A test for you and a test for the people that are allowing satan to manipulate them. Knowing the value of God in you will help you pass all tests with flying colors and with abundant glory for God through your life. Opportunities created by the Hand of God for your life will be revealed when you continue to trust in, rely on, adhere to, abide in and wait on the Lord. And when you get a "Hook-Up by God" nothing can stop you! amen. Praise God In The Name Of Jesus! Matthew 5:10 "Blessed ARE those who ARE persecuted for Righteousness' sake, for Theirs IS the Kingdom of Heaven." When I read His Word, I see over and over again where He makes it very clear, that God made a promise To Always Be With Us. And all we have to do is Trust in His Love and Leave our cares to Him. Thank You Jesus. amen. I Encourage you to Continue to Let God's Light shine in you and through you to bless those that He sends to be feed from your garden. If you can't be fed--then BE Bread! I have the desire to see God's handiwork in you come to completion for the building of His Kingdom here on earth as It Is In Heaven. CONTINUE TO BE A WITNESS TO WHAT LOVE HAS DONE! I wholeheartedly agree. In those times where I've found myself bitter against something or someone, I can look back and realize how I claimed absolutely no Faith, whatsoever. Also, I enjoyed the Stevie Wonder & Kim Burwell song. i remember those times also don. and i can say that i am happy they are in my past and i try my best to clip myself if i think any thooughts like that. it's not worth it at all when you look back at situations and how everyone acted and re-acted. now i don't mean either to allow people to treat you a certain way--but to forgive them so you grow. there are many people i have forgiven and do everyday and i don't say it to their faces.. but to God, and i feel fine about things. we got to keep each other on our minds and remember to help each other in what ever way we can. @ don, i love stevie and kim!! that song is along the lines of marvin gaye when he went through his 'speak the truth' period. honestly, as i listen to the songs by stevie, i am more convinced that he is nothing but a prophet. @ wisdomteachesme: i think both stevie wonder and marvin gaye are/were musical genius. always thought-provoking lyrics. yes, so true about both men. and many times they have stood alone as they bring our attention to what should be important in our lives=other people! usually when you stand for truth many people will not stand with you--and that should not make you stop believing in what Truth you do believe in! God will send others with the same focus and integrity to take a stand with you. ohhhh i have not thought about that song in a long time...ok, let me go pull that out and give a listen to.